A Blue Willow teapot is a wonderful addition to a Blue Willow china collection. Also, there are so many variations of the teapot, made by different manufacturers, that it makes sense to just collect teapots in the pattern. My impression is that all (or most) manufacturers of the Blue Willow design produce Blue Willow tea sets to accompany their dinnerware line. 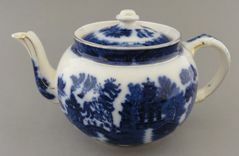 The transferware pattern is displayed as a blue under glaze on a white background. It features an oriental scene with pagodas, a bridge with people on it, a boat, willow trees and other plants, and the famous two love birds. The pattern itself tells a story that is based on a legend of two lovers who were not accepted by the girl's family and transformed into birds to fly away and be together. 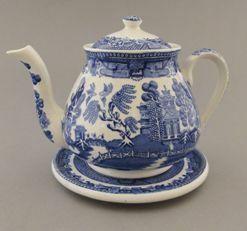 There are several dinnerware companies that are currently producing the Blue Willow pattern and there are many more that used to, so there are many choices of teapots that exhibit this wonderful, timeless design. 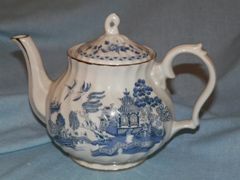 I was amazed at the selection of antique and vintage Blue Willow teapots that are available. I was browsing for teapots to see which companies made them, and found that many companies made them with various takes of the pattern. Apparently they were produced in England, China, Japan, the United States, and Australia, just to name a few of the originations that I ran across in a short browsing session. I found that they are available in many shapes, from rounded to square and in various designs with embossed features, some smooth and some with ridges. I even found some with gold trim and accents. In my eyes, the Blue Willow dinnerware pattern is highly collectible. Many dinnerware collectors agree with me. This one of the most collected patterns of dinnerware today. It has been produced since its creation in 1780. If you are interested in collecting, learn all you can about Blue Willow china.